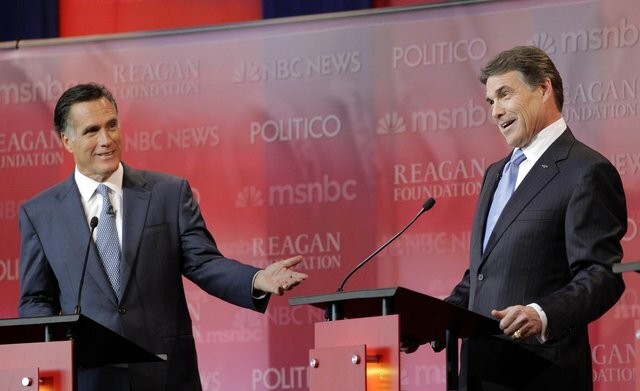 SIMI VALLEY, Calif. — Mitt Romney and Rick Perry wasted little time in going straight at each other Wednesday night, sparring over whether the former’s business experience or the latter’s decade as governor of Texas is better training for boosting jobs. “Michael Dukakis created jobs three times faster than you did, Mitt,” Mr. Perry said, referring to the former liberal Democratic governor who lost the 1988 presidential election. “George Bush and his predecessor created jobs at a faster rate than you did, governor,” retorted Mr. Romney, a one-term Massachusetts governor who made his fortune leading a capital investment firm, as he pointed to the man whom Mr. Perry succeeded in 2000. With the Republican presidential nomination on the line, the Republican field squared off at the Ronald Reagan Presidential Library in a nationally televised debate in which the candidates clawed slightly at each other, but aimed their chief darts at President Obama on issues such as the economy and his health care initiative.